Add instant storage and style to your master suite when you bring home this chesser, from the Southern Heritage collection. The top pier deck features three storage drawers, and combines with the four drawers and two doors of the chesser for ultimate storage capabilities. 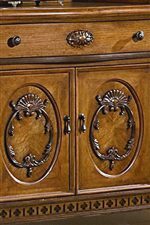 The chesser features fancy metal hardware, turned bun-style feet, paneled drawer fronts and decorative carvings. Welcome classic warmth into your home decor with this chesser. For added height and light, pair the piece with the coordinating mirror, also from the Southern Heritage collection. The Southern Heritage Seven-Drawer Two-Door Chesser with Pier & Molding Details by Vaughan Furniture at AHFA in the area. Product availability may vary. Contact us for the most current availability on this product. 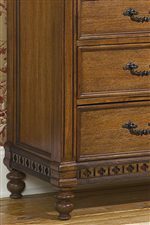 327-04P Traditional 3 Drawer Chest Pier 1 23" 19" 22"
327-04B Chesser Base 1 54" 19" 34"
Grand, traditional styling flows throughout the Southern Heritage bedroom collection. 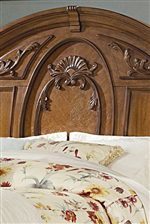 Turn back time with the intricate detailing and wood carvings, paneled drawer fronts and sides, turned bun-style feet, fancy metal pulls and bold top moulding. Mix and match between the dressers, chests, mirrors, beds and night stand. 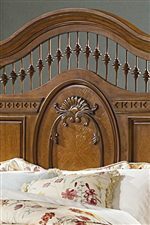 Constructed of hardwood solids and flaky oak veneers in a rich chestnut finish, find the perfect look for your master bedroom with an addition from the Southern Heritage Collection. The Southern Heritage collection is a great option if you are looking for Traditional furniture in the area. Browse other items in the Southern Heritage collection from AHFA in the area.